Rust is a generic name given to iron oxides and metal corrosion. Aluminium is a lightweight metal whose good thermal conductivity makes it popular for making cookware and pans. It is often combined with other metals, as it tends to alter the flavour of some foods. Pans made solely of aluminium will corrode, as combining the metal with water and oxygen results in oxidation -- and the formation of aluminium oxides. Rust, or iron oxide, will only form on pans that also have an iron content. 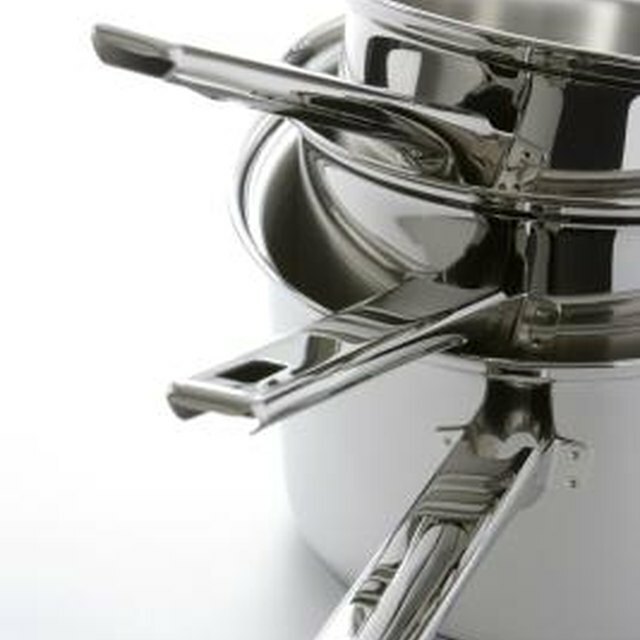 Iron and aluminium oxides can be removed from pans using acids, such as a vinegar solution, or by mechanical means, such as by scrubbing the surface with steel wool. Using a combination of these two methods yields the best results. Rust can make your cookware unsightly. Make an acid solution by combining a cup of vinegar with three cups of water in a bowl. Put on the rubber gloves for protection. Use the sponge to distribute the vinegar and water solution over the surface of the pan, rubbing vigorously to remove any rust, stains or corrosion. Pour the remaining solution into the pan and leave it to soak for thirty minutes. Top up with additional vinegar solution as necessary, to ensure full coverage of the affected areas. Pour the solution out of the pan and rinse. Check to ensure that all corrosion and stains have been removed from the surface of the pan. If not, soak in the acidic solution for another hour and rinse again. Pour approximately a teaspoonful of dishwashing liquid into the pan. Vigorously scrub the entire surface of the pan with dampened steel wool, removing any remaining traces of rust or corrosion. Dry the pan with a kitchen towel or allow to air dry. Soaking with a stronger solution of vinegar and water, or with pure vinegar may be necessary for extensive corrosion. Scrubbing with steel wool might not be required for less severe cases if the soaking with acid solution is sufficient to remove corrosion. Wear rubber gloves and promptly rinse off any acidic solution that comes into contact with skin. The Rust Store:" Does Aluminum Rust?"